This year’s Buddhist summer retreat in Sakya Changlochen Ling presents the rare opportunity to receive the full cycle of Tara initiations from the lineage of Atisha. Tara can be described as the enlightened mind appearing in a feminine form, guiding and protecting the beings who have been fortunate enough to be initiated in her practices. The retreat will start with the main initiation of the Green Tara, which will entitle whoever wishes to attend the course to receive the remaining 21 initiations. Each of them will allow us to receive the various pacifying, increasing, magnetising and wrathful energies of the different forms of Tara and apply those in our life if we decide to engage in their practices. However the benefits of just receiving the initiations are enormous. If you can’t come for the full two-week course you can attend as many days as you wish. However, attendance on the first day (August 19th) is necessary in order to receive any further initiations during this course. This will be the first time Lama Jampa gives this collection which is bestowed only rarely in the West. 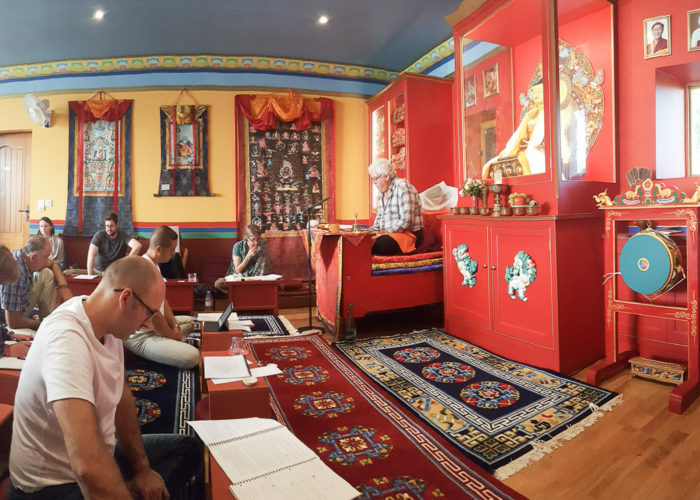 The initiations will be given daily at Sakya Changlochen Ling over the two weeks from Sunday 19th August to Friday 31st August (excepting Saturday 25th August). There will also be a daily afternoon practice of the Green Tara sadhana.